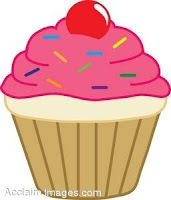 Yesterday I was contacted by Brandi, a very sweet reader, and she wanted to know if I could share where I got the cupcake art that was on the wall in my daughter's bedroom in the last post. Sure thing! 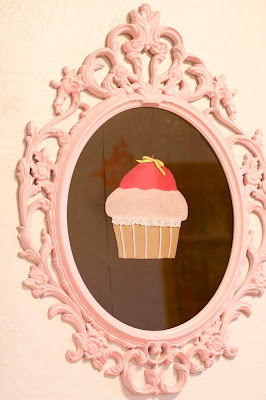 The frame was an Ikea clearance item that I spray painted pink, and the cupcake was just felt "art" (in the very loosest sense of the term) that I made on a whim one day. It's actually not my favorite picture....something about the colors seems wrong. But I made another mini version last night to show you how, and I like it much better! 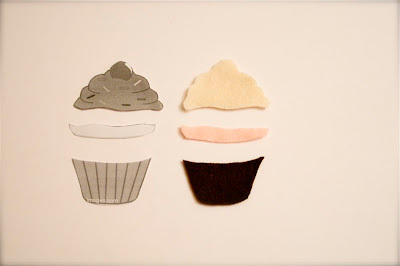 Cut out each section of your clipart separately, and use them as patterns to cut out your felt. 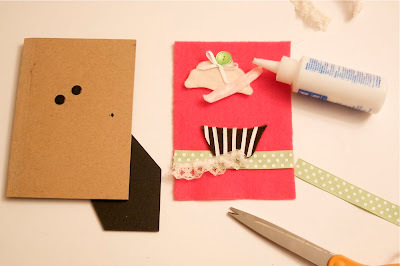 Cut yarn or a very narrow ribbon to the length of your "wrapper" piece, and glue on with fabric glue, or hot glue. Cut out a piece of felt the same size as your frame backing, and glue all your little felt pieces on where you want them! Use more ribbon, lace, and buttons to embellish! Put it in the frame, and replace the backing! Ta-da! Free artwork. I think I might use this same idea to make a little sailboat for my nephew's room! that's a cute idea. i actually did a similar thing with that ikea frame: i spray painted it cream but hung it up empty on a wall of frames in my living room. the pink is adorable, though. I'm in love with this artwork! 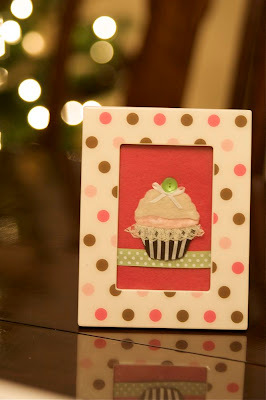 I have developed a mini obsession with all things cupcake so I have to make one of these. Thanks for the great idea!! So what kind of camera do use??? Your pictures are amazing! Based on these pictures I'd say your little girl has an amazingly cute, girly room! I'm sure my girls would be in heaven in that kind of room! Ok, that is the cutest cupcake EVER!! thanks for sharing! So. Cute. You are like, chock full of great ideas!! What an excellent idea!! 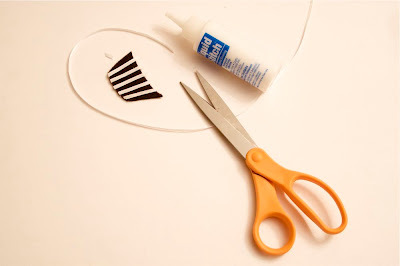 I think I'm gonna pick up some cute dollar store frames, paint them, then give this a try! Maybe do some ballet slippers for my dd room!! Your daughters room is so sweet! I LOVE your blog! 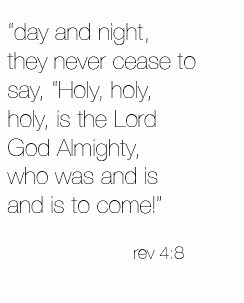 I read and reread it nearly everyday!! That is the sweetest thing! I adore cupcakes. And I was just at IKEA today looking at that frame. Adorable! Where did you get that piano? Who makes it? That is super cute! My daughter loves playing the piano. What a great idea! And wow, your daughter has the coolest pink room. I want to do a snow angel on the pink rug! Looks way too soft. 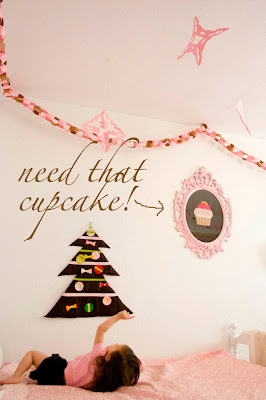 Cute Christmas tree idea too! Ok, so this is too adorable and a little like Déjà vu! 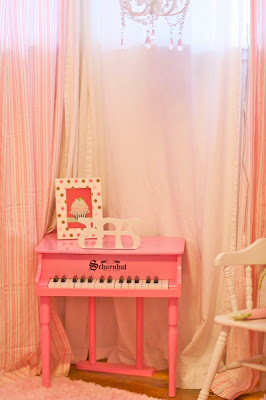 I made my grand-daughters room in the same theme and here is the Déjà vu part.... she has the exact same piano in her room! How weird is that? I actually never saw a room done in this theme or heard about it until after I came up with the idea and then googled it. Too weird. I would love to see more photos of the room you did. thanks for all your talents.